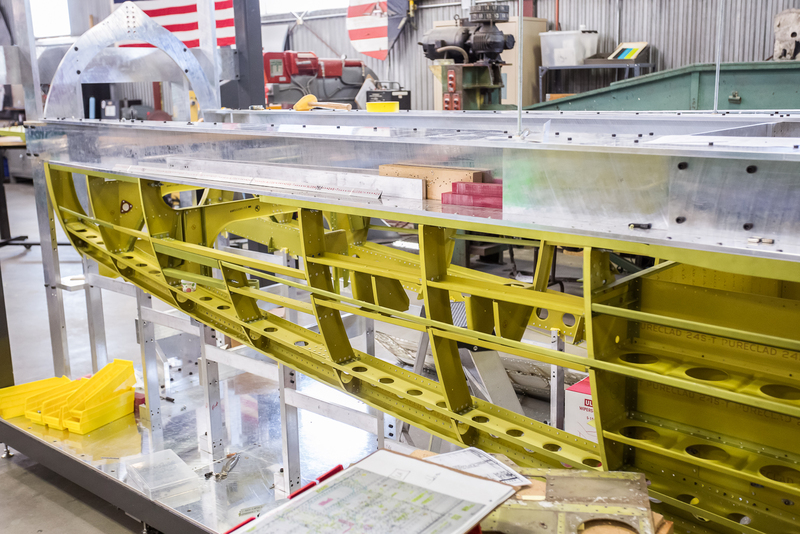 This month a lot of work was done on preparing the lower fuselage frame for skinning. 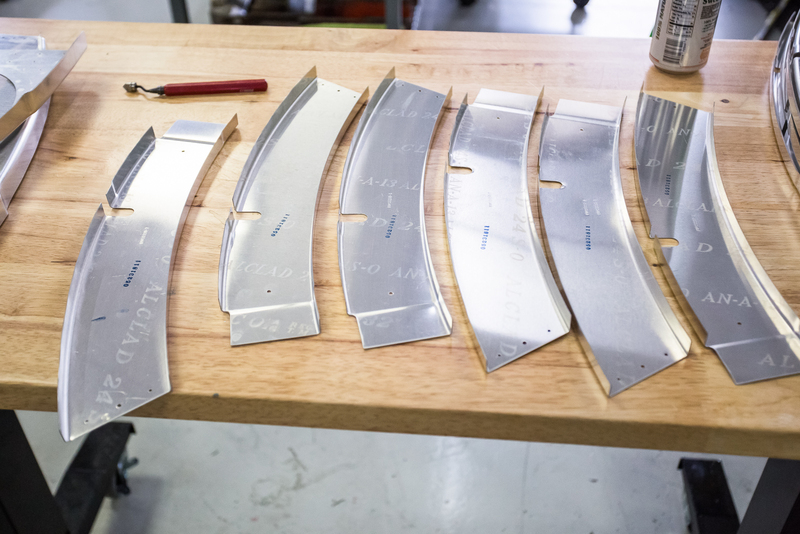 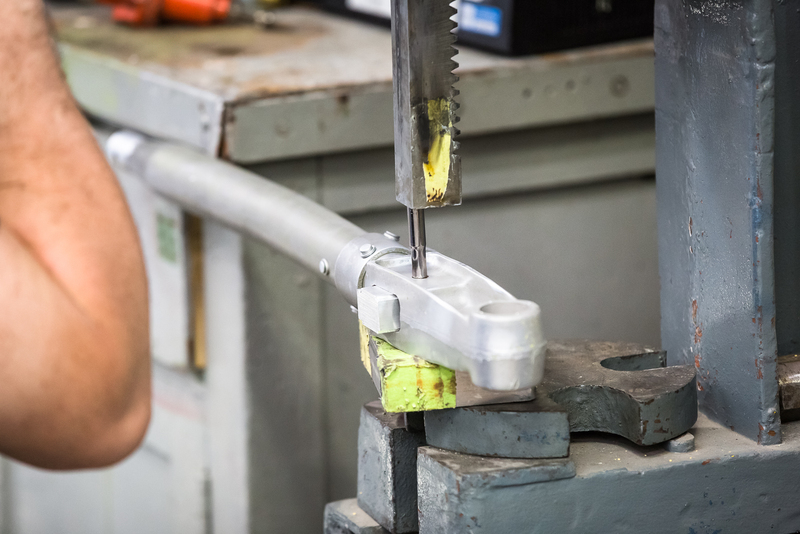 The production of skins is a process involving cutting, trimming, many trial fittings, and finally riveting the new skin sections in place. 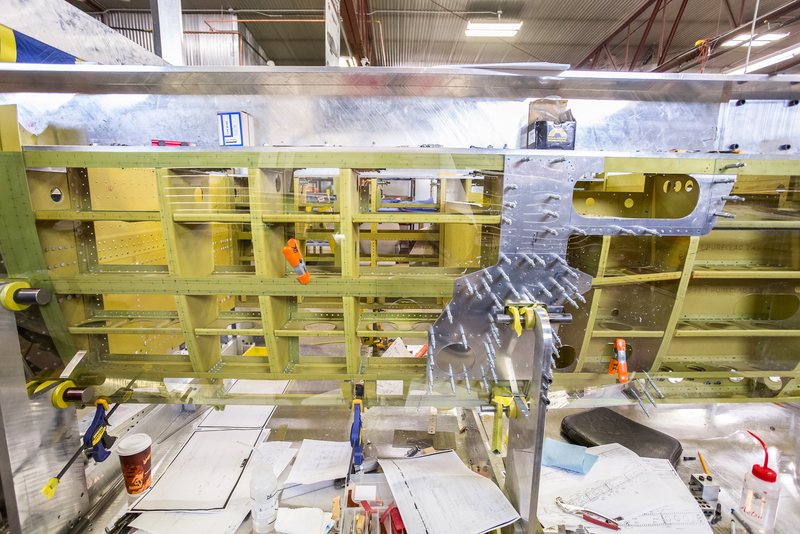 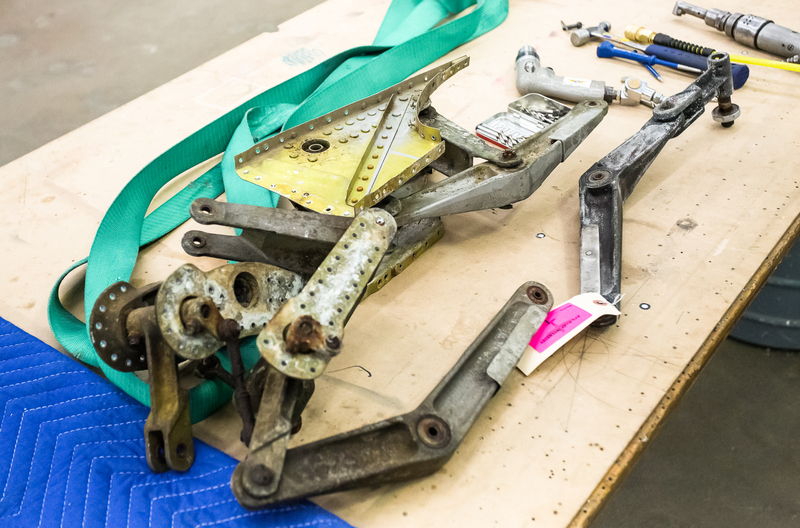 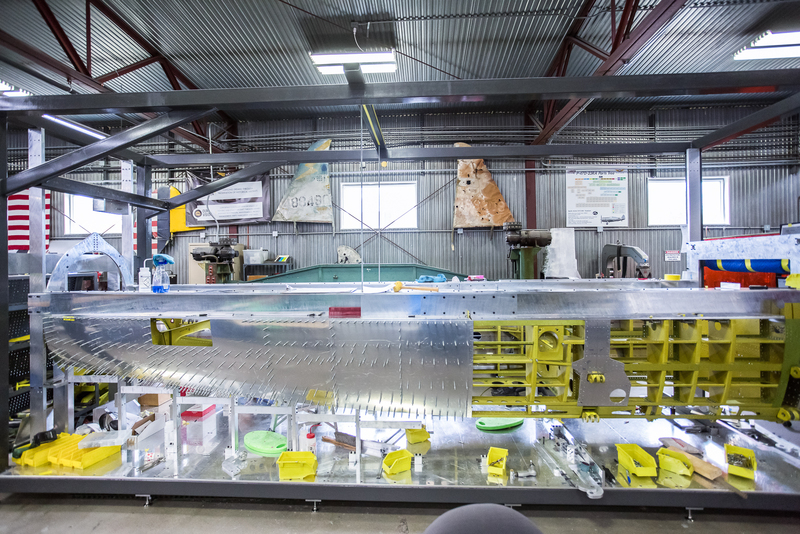 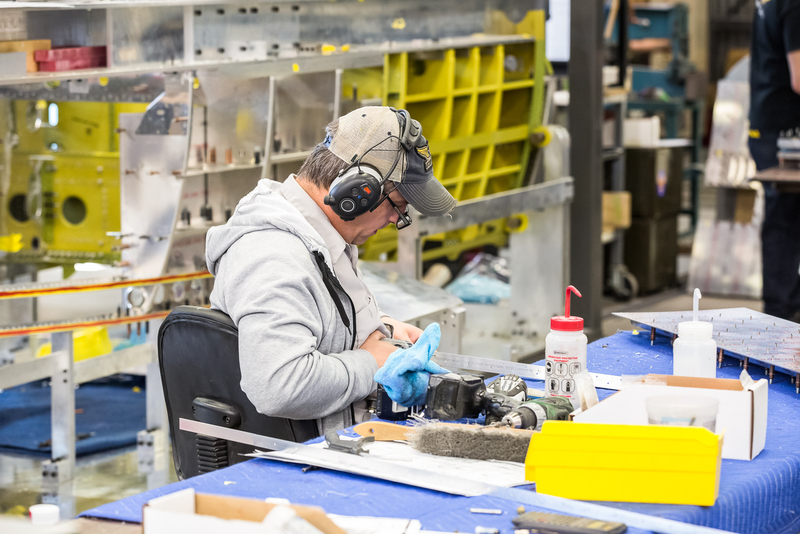 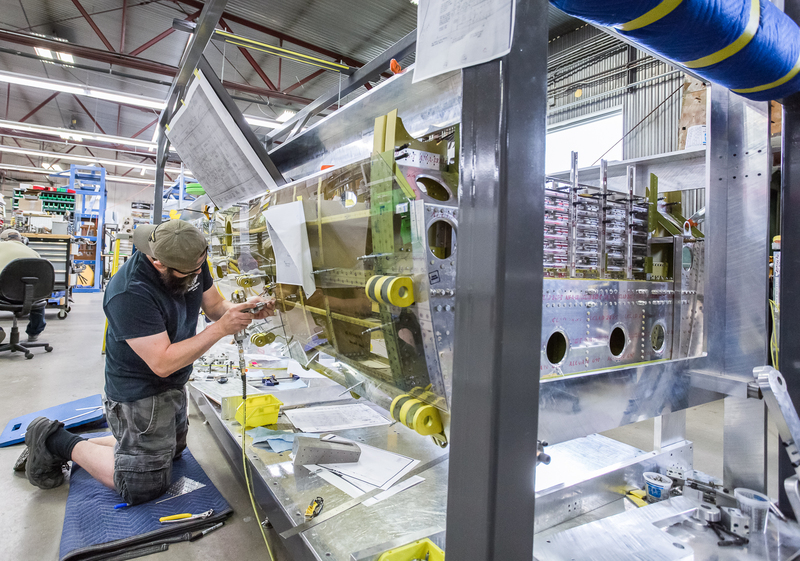 At the same time, the upper fuselage components are being prepared for the next step in the restoration. 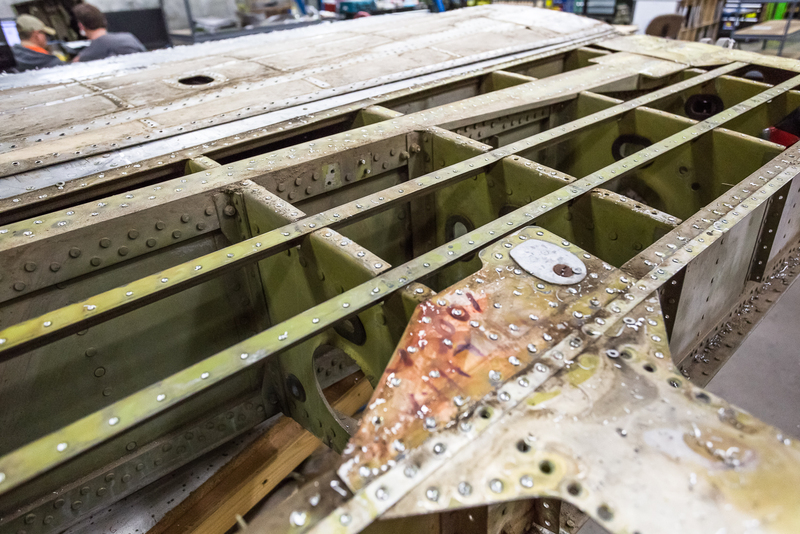 Also this month, the P-47’s wings are being disassembled. 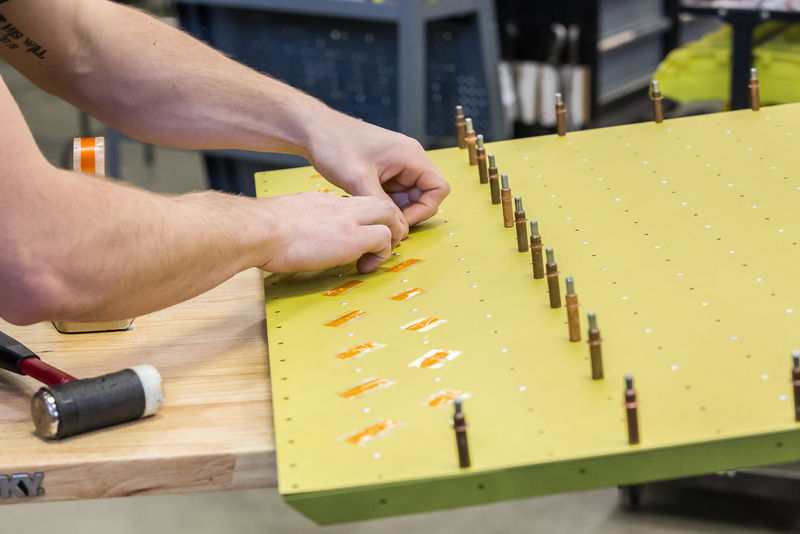 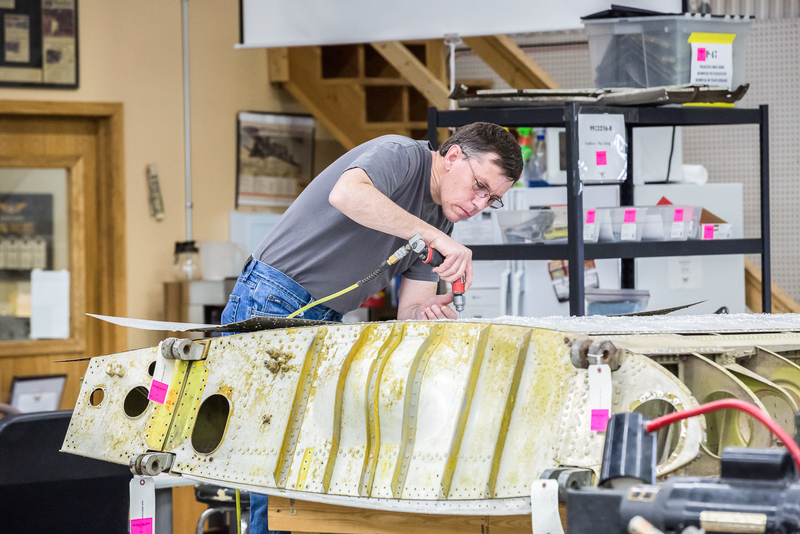 Wing parts are also being inspected and classified as reusable or for patterns. 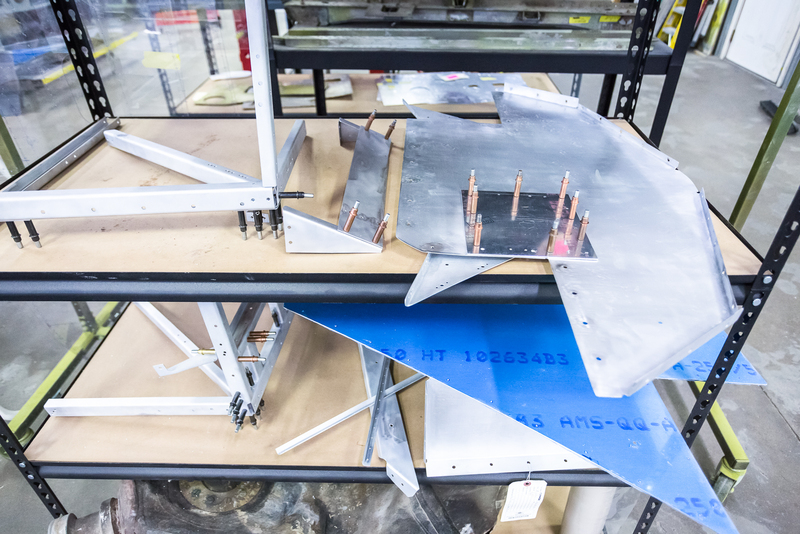 After months of work, the lower forward fuselage frame has been permanently assembled and the last few steps before skinning took place. 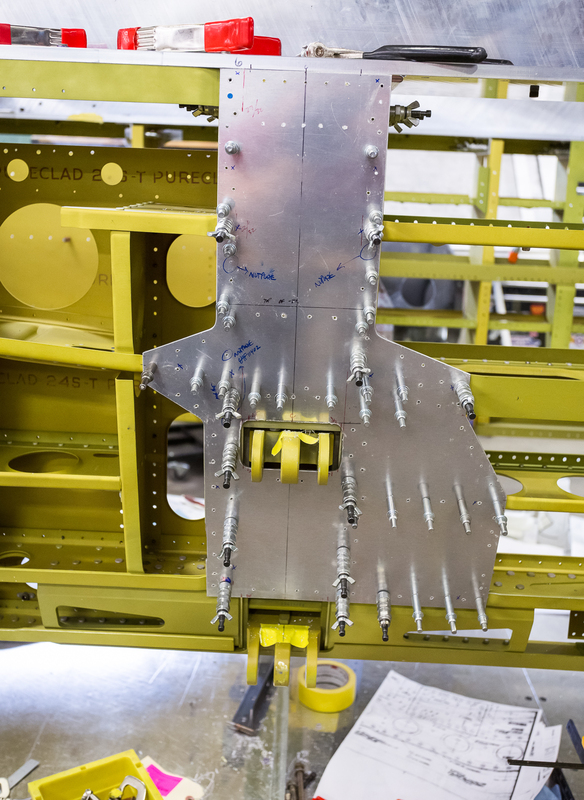 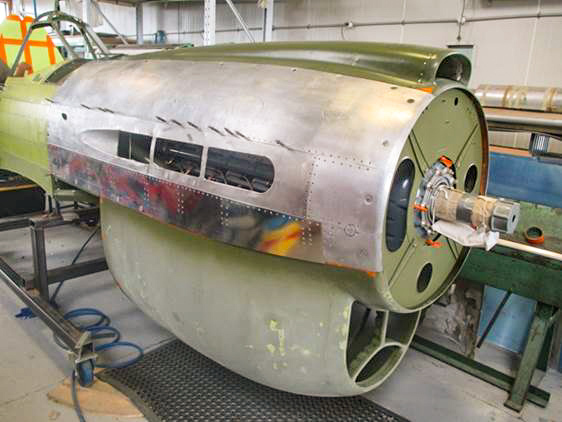 The underlying frame of the lower P-47 fuselage is completely painted and reassembled. 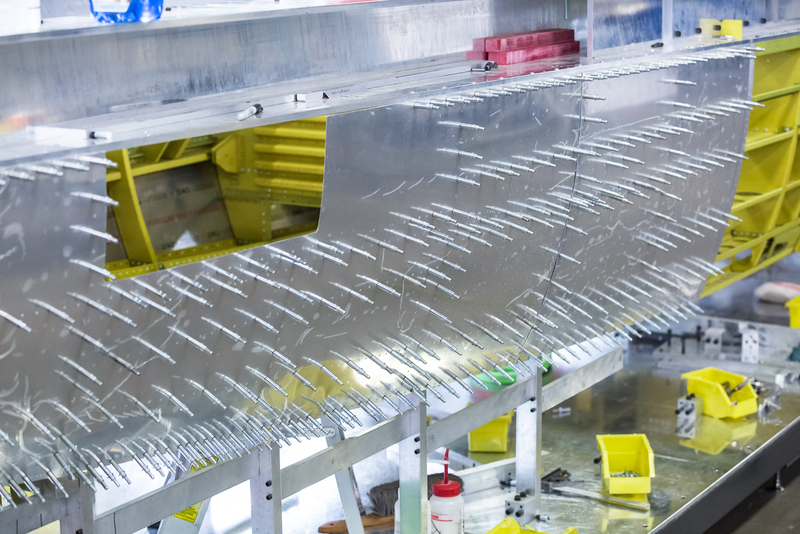 Next is the long process of producing skins. 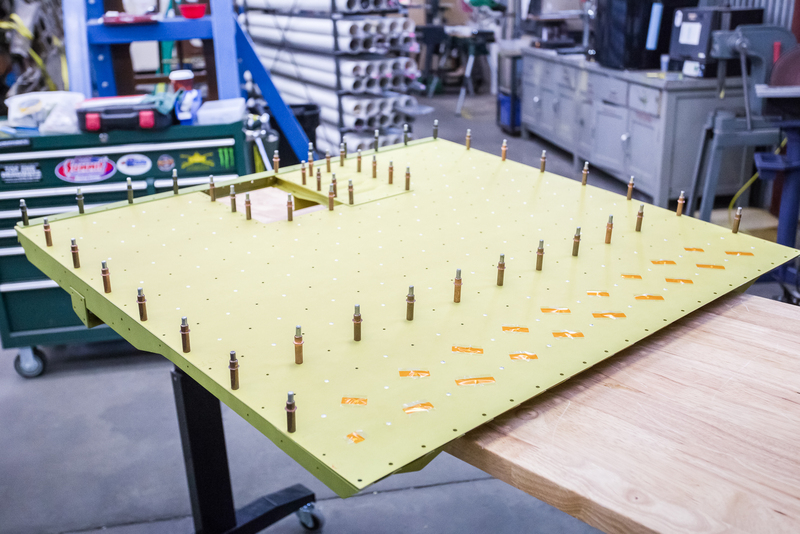 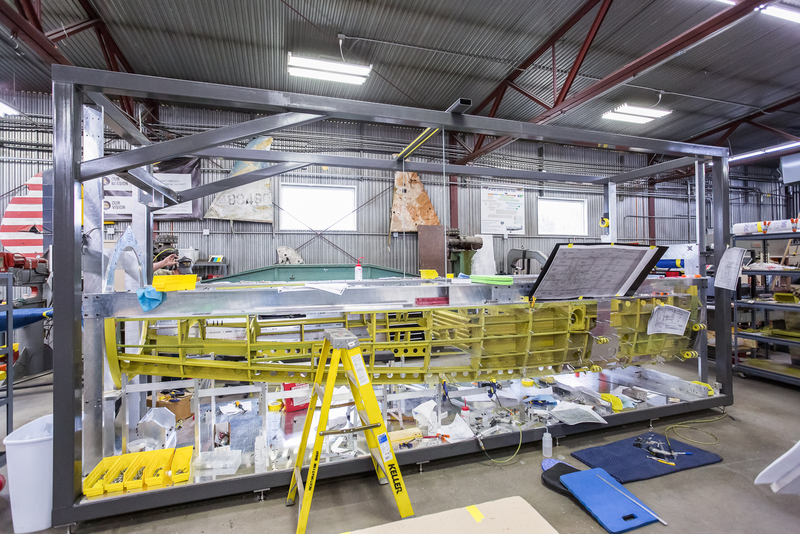 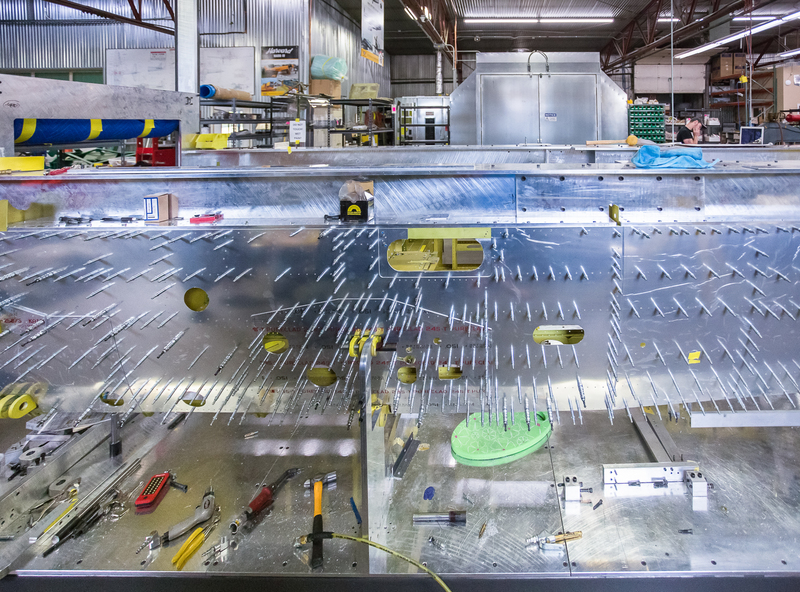 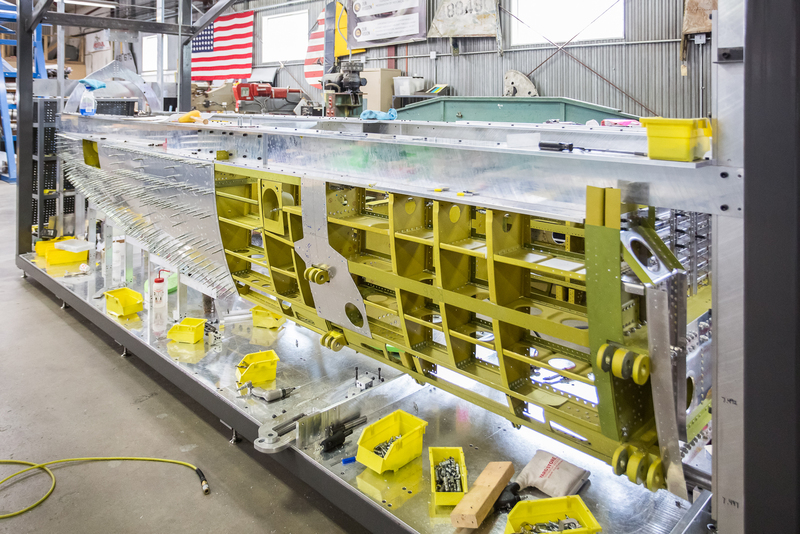 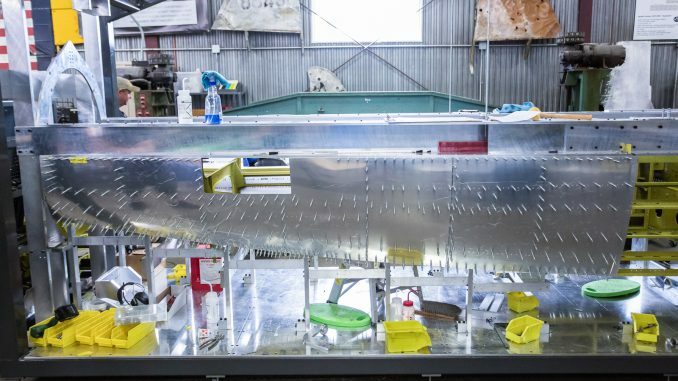 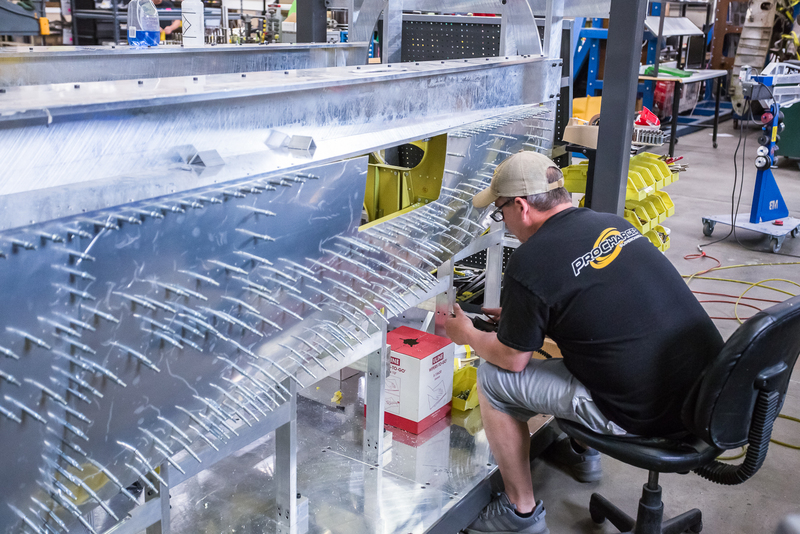 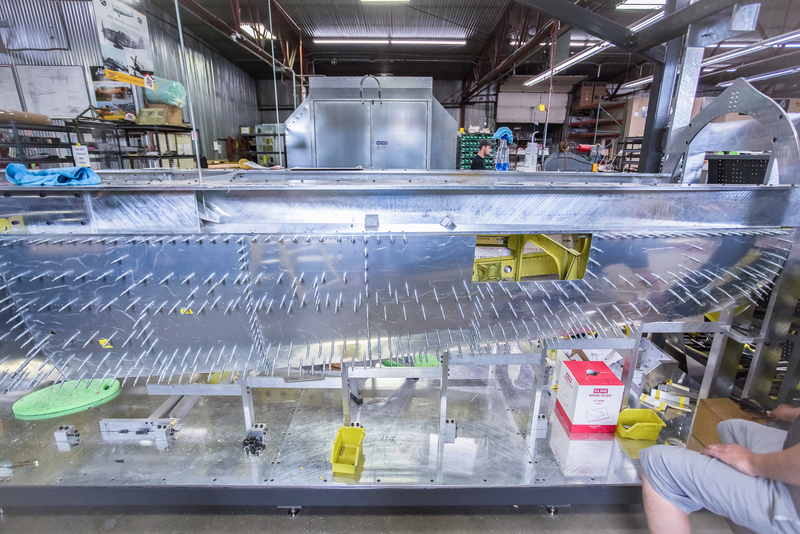 First, a clear plastic template is created using both the engineering drawings and test-fitting it in place on the actual fuselage. 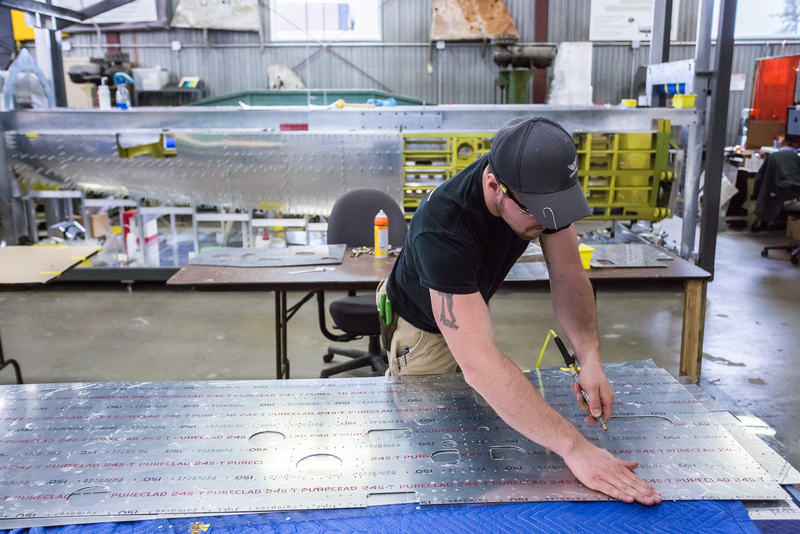 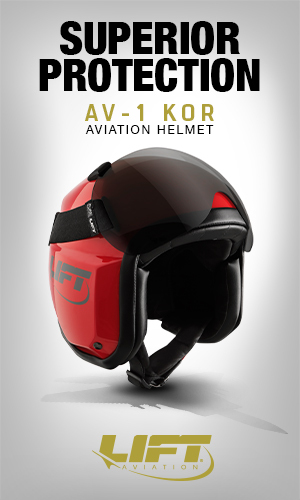 Then, once the template fits perfectly, an aluminum skin is cut, drilled, and fitted. 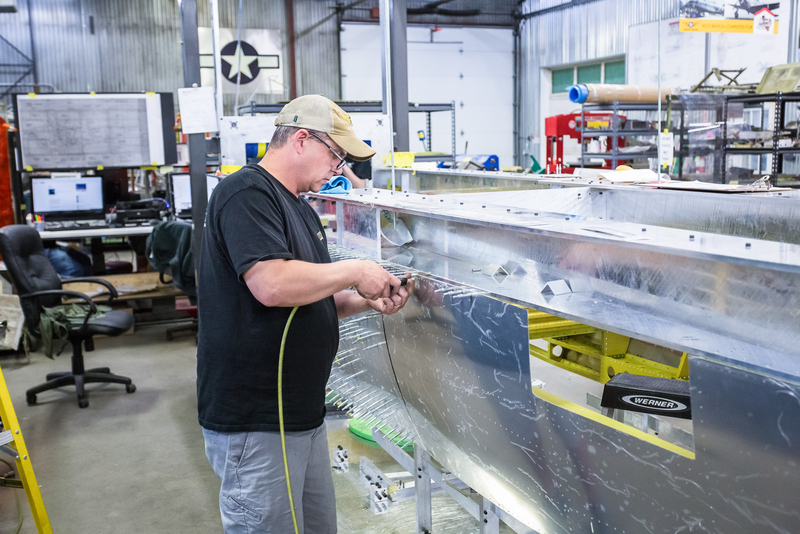 Permanently skinning the lower forward fuselage signals the impending completion of this step so parts for the next step of assembling the upper fuselage are being prepared. 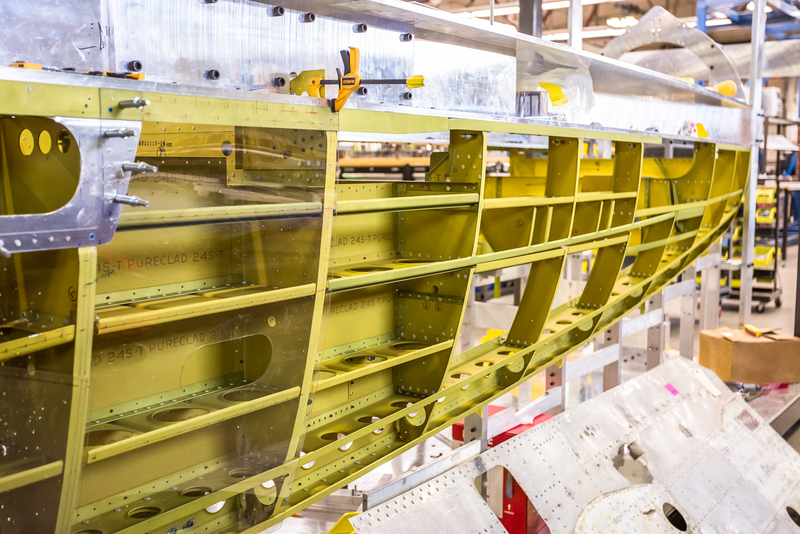 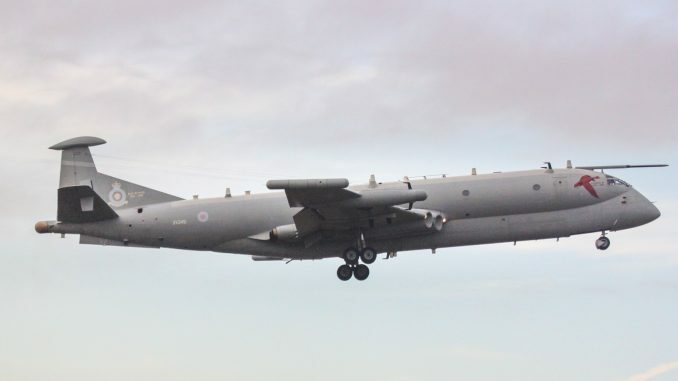 That ensures the restoration will continue without delays once the lower forward fuselage is done. 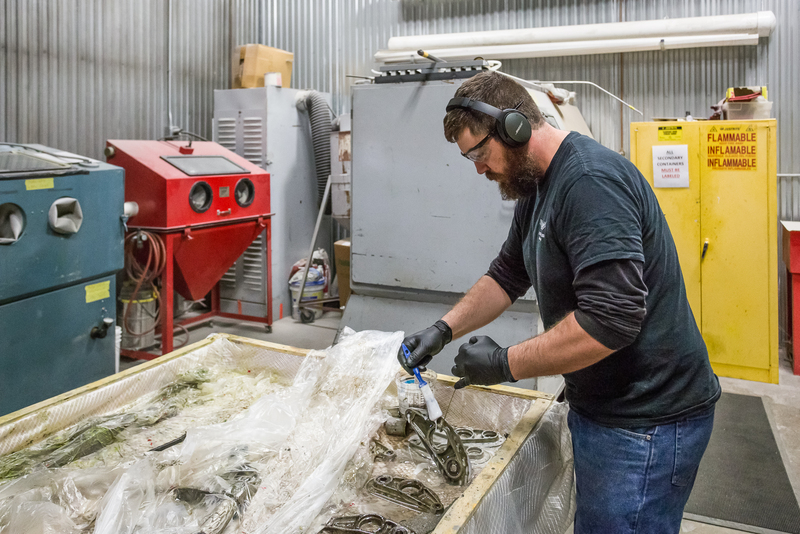 Ryan Underwood is our restoration manager. 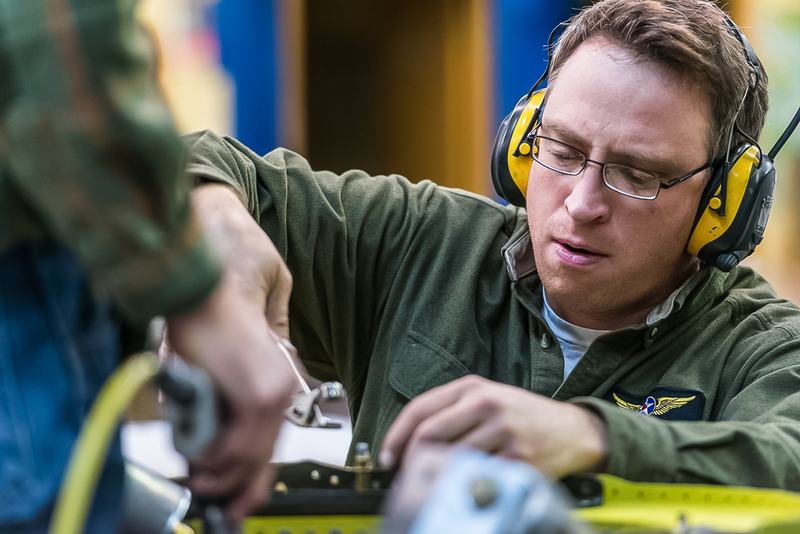 He has been with AirCorps almost from the day the doors opened in 2011. 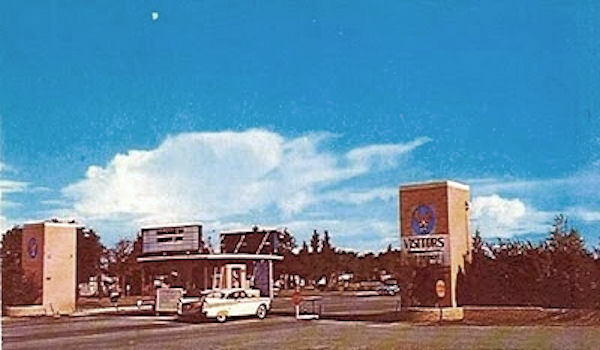 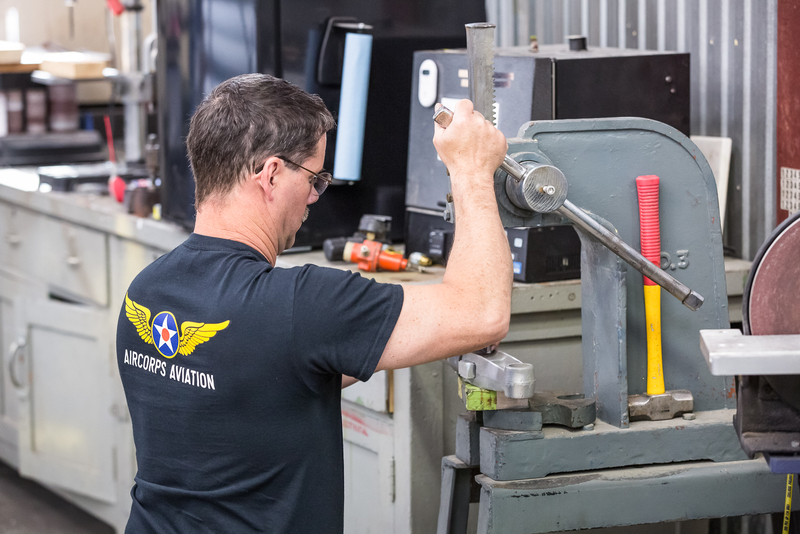 He is a Bemidji native and a great example of the available workforce in this part of the country where many folks still have skills working with their hands. 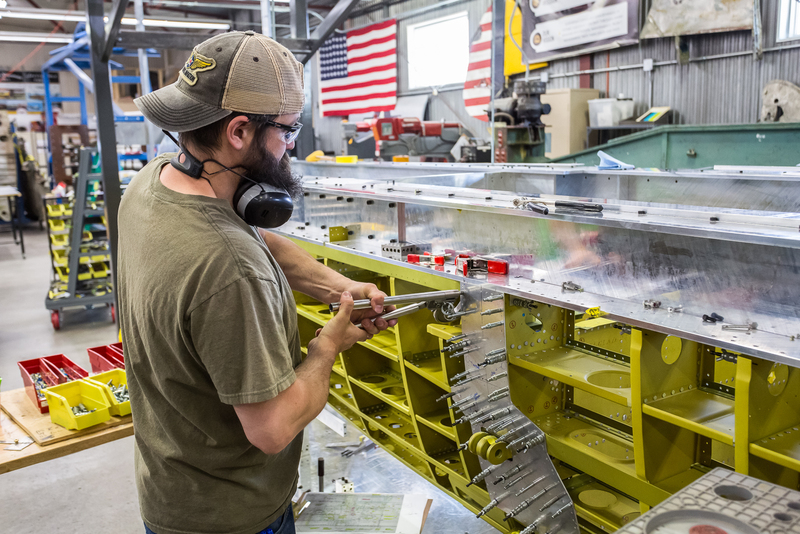 Ryan has a Bachelor of Science in industrial technology and his early career was in the field of construction management. 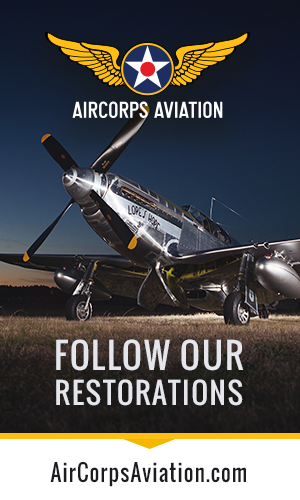 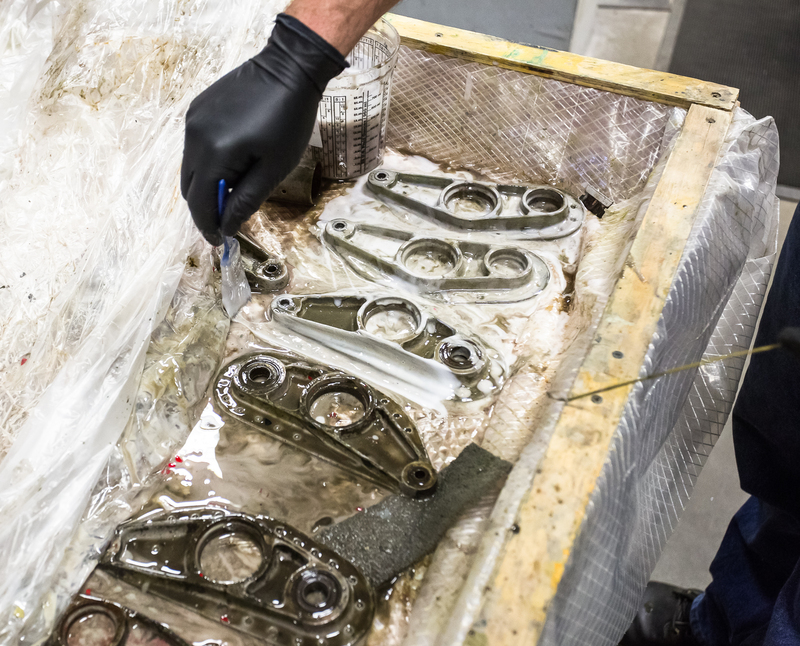 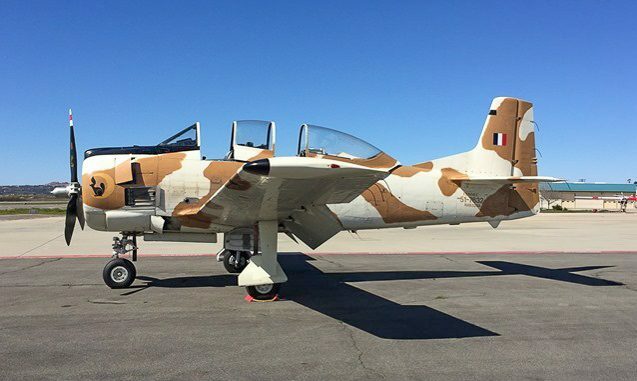 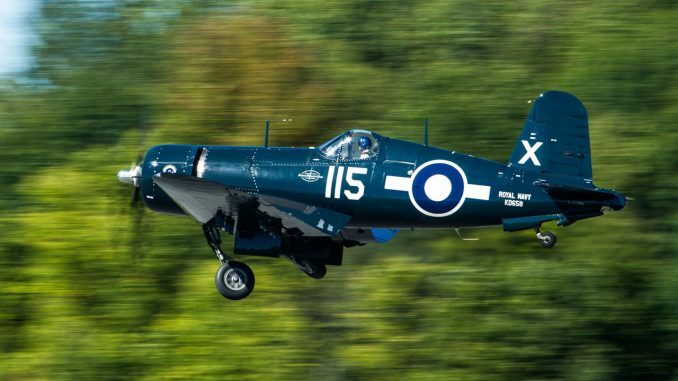 His attention to detail and efficient management of the restoration workflow are big reasons for the quality reputation that AirCorps Aviation’s warbird restorations have earned. 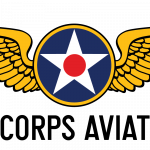 Ryan is a licensed private pilot. 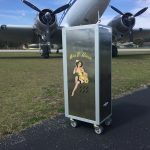 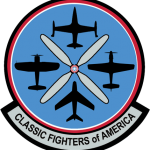 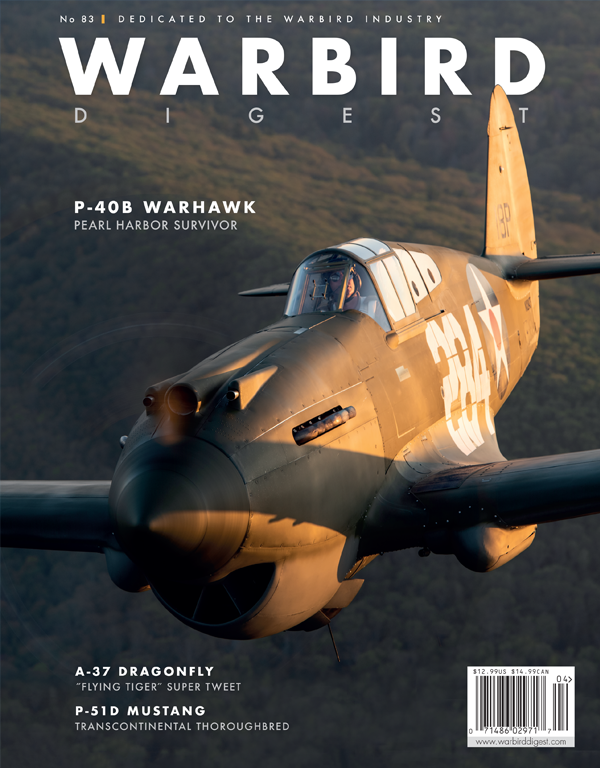 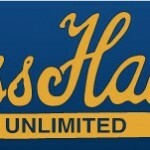 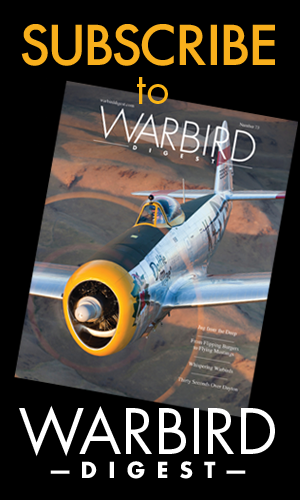 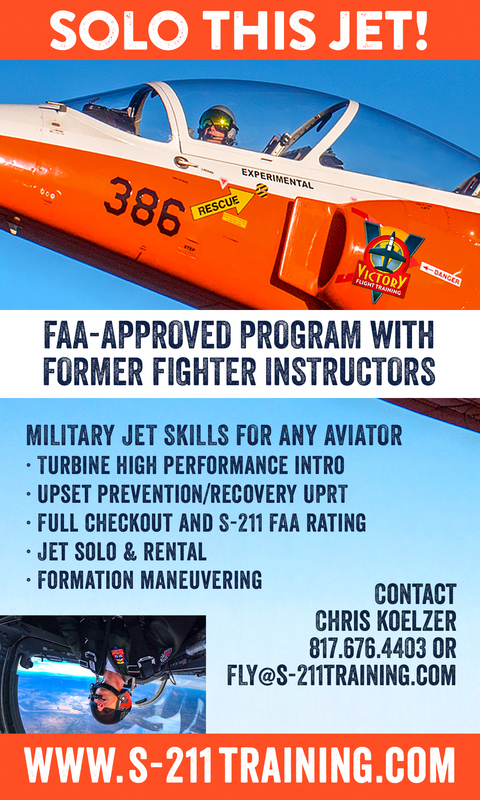 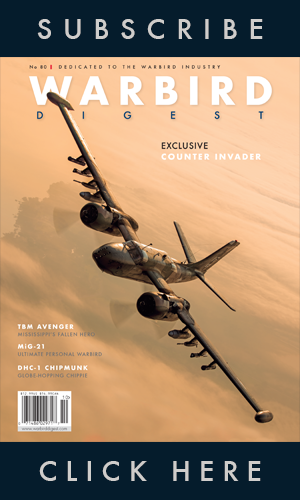 He is really looking forward to working on one of the projects coming up after the P-47 – that project is the P-38 Lightning, his favorite warbird.